L’Annonce Faite A Marie (The Annunciation of Mary) is a 1912 play in four acts by Paul Claudel. The drama is centered around a young woman named Violaine who contracts leprosy from a friend (Pierre de Craon) and is banished from her family by her jealous sister Mara. At the start of the play, Violaine learns that Pierre, who is a stonemason and a builder of cathedrals, is suffering from leprosy. As a show of compassion, Violaine kisses Pierre. But Violaine is engaged to be married to Jacques Hury, the same man whom Mara loves. Mara conspires with her mother to break up the relationship between Violaine and Jacques. Mara approaches Violaine and informs her sister that she knows the truth about her condition. Without a warning, Violaine leaves home to live alone in a cave outside of the village. Shortly afterward, Anne Vercors, the father of the household, sets off on a pilgrimage to Jerusalem. Everything seems to be going in Mara’s favor, but her luck soon runs dry. She is not as “in control” of her life as she thinks. Written in the style of a medieval mystery play, L’Annonce Faite A Marie has more than just an earthly dimension; it has a pronounced cosmic dimension. There are miracles in the play of Biblical magnitude. Violaine is not merely a pitiful character. Her suffering has a spiritual significance, one that the characters discover over the course of this lengthy play. Although the play is a little over three hundred pages long, I got through it in the space of two days. This is a play unlike any other written in the last century. As I mentioned above, it is written in the tradition of the medieval mystery plays. Therefore, the audience is expected to know something about the Christian faith. The Mass and the Angelus feature prominently as well as a few earth-shattering miracles. Like much of Claudel’s works, there is no real frontier between the earthly and the spiritual. God’s hand guides the action. 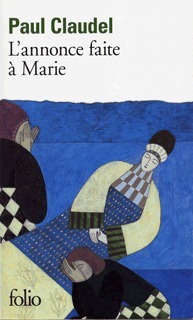 L’Annonce Faite A Marie really caught my attention as I have a great interest in medieval French hagiography particularly in the context of performance. I welcomed the blending of the sacred and the profane, and (for the most part) appreciated what Claudel was trying to accomplish through his play. However, I was shocked by the ending. The whole play was an emotional roller coaster ride. There was one life-changing event after another. And I enjoyed it. I raced toward the end hoping that there would be a neat conclusion, but there wasn’t one. Mara’s character continues to baffle me. I wanted her to develop as a person, and evidently she does, but her development is so subtile that I missed it the first time I read Act IV. I have since reread the last act along with the alternative ending. Although I understand the endings more than the first time I read them, I can’t honestly say that I’m satisfied. L’Annonce Faite A Marie definitely challenged my expectations. I have a tendency to expect a certain kind of ending from stories. I hope to reread the play sometime soon because I was so emotionally involved throughout most of it. In fact, I have never experienced such emotions whilst reading a play. If you like reading plays, I highly recommend this one despite my reservations about the ending because it is different than anything you’ve probably ever encountered.